Hello all! It is I, your friendly neighborhood guest blogger, Monarch Lady! I am so very glad to have the chance to spend some time with all of you once again! 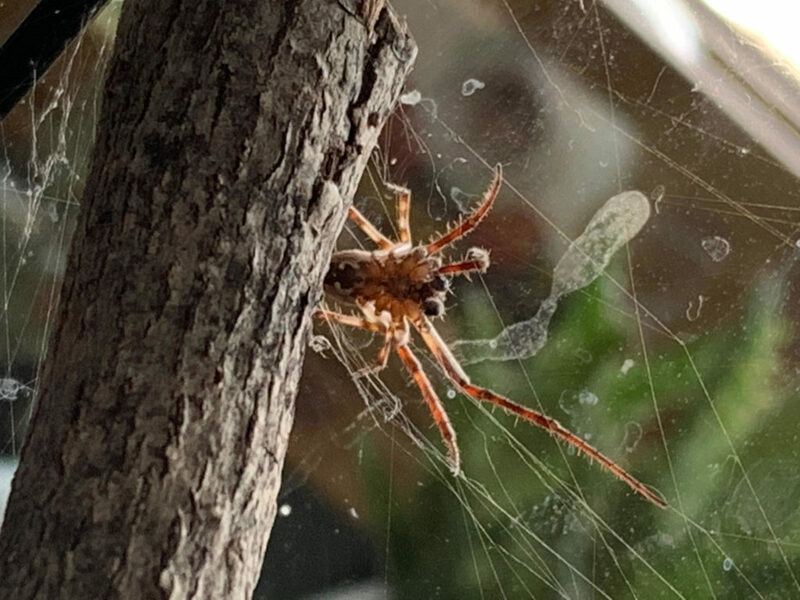 Anyway, every winter that comes and goes seems longer and harder than the one before, at least when it comes to my longing for all things creepy-crawly. I spend many hours pouring over all the pictures of insects that I took on my summer bug-hunting ventures, and obsessively clean my Monarch Butterfly raising gear just awaiting their fluttery return. I also, much to the consternation of my dear family, start appearing at the dinner table covered in cobwebs and dust after I have spent the afternoon on my knees crawling around in the basement and attic in search of spiders to bring into my bug room to care for. I am happiest when I get to rear little bugs into bigger bugs, when I can watch them feeding or digging or building or whatever it is they do best. The best part, really, is how very easy it is to care for many of them. Which is when it occurred to me: insects make great pets! 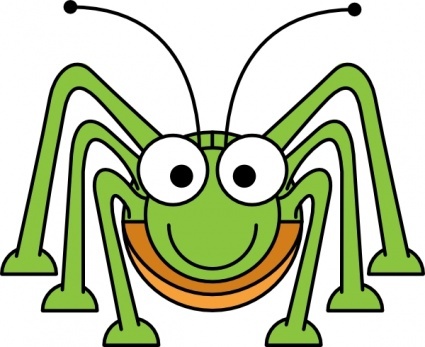 For those of you reading this blog, I am assuming you also love bugs. If you can’t help but watch closely all the insects you come across outside, if you come to Tony’s Creepy Crawly Zoo shows just to have the chance to hold and interact with bugs, you too don’t have to suffer all winter long waiting for bugs! So let’s talk about insects as pets! Keeping insects does not have to be difficult, and it does not have to involve spending a lot of money. Meet Pider! Pider is the spider I found this year in the basement. When I found Pider, Pider was tiny. Pider is not tiny anymore. I captured Pider in a jar and brought him upstairs to my bug room and put him in a bug box, where he has lived ever since. All Pider really needs in a piece of wood to hide behind, and a few sticks to make his web on. I also have some woodchips on the bottom of the box for being pretty. I got all thst stuff from my very own yard. Once a day, I spritz Piders habitat with a little water, and shake in a few fruit flies for his dinner. You can get jars of fruit flies at a number of pet supply stores, and they are not terribly expensive. They also last a long time. Meet Tick and Tock! Tick and Tock are Blue Death Feigning Beetles. 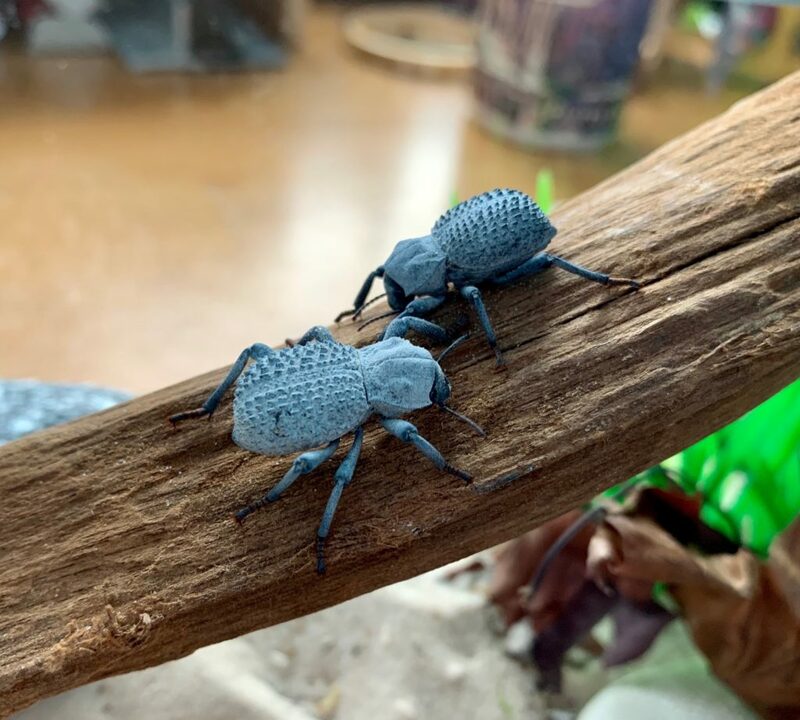 Native to the deserts of Arizona and such, they are adorable little blue beetles that pretend to be dead when they get frightened. They are extremely docile, and very easy to care for. They get all their water from the foods they eat, and they eat just about anything. Scavengers in the wild, I feed them carrot, lettuce, dried oat meal, blueberries, barley, and the occasional freshly dead bug. If we lived in Arizona we could just go outisde and roll over a log and find these guys everywhere. Alas, we do not reside in Arizona. So, these two I did purchase online for a very inexpensive sum. They live in a bigger bug box with sand and a place to hide and a branch to climb and are very comfy and content. So content, in fact, that they recently became parents, so I am hoping for baby Blue Death Feigning Beetles very soon. Congratulations Tick and Tock! Meet Larry! 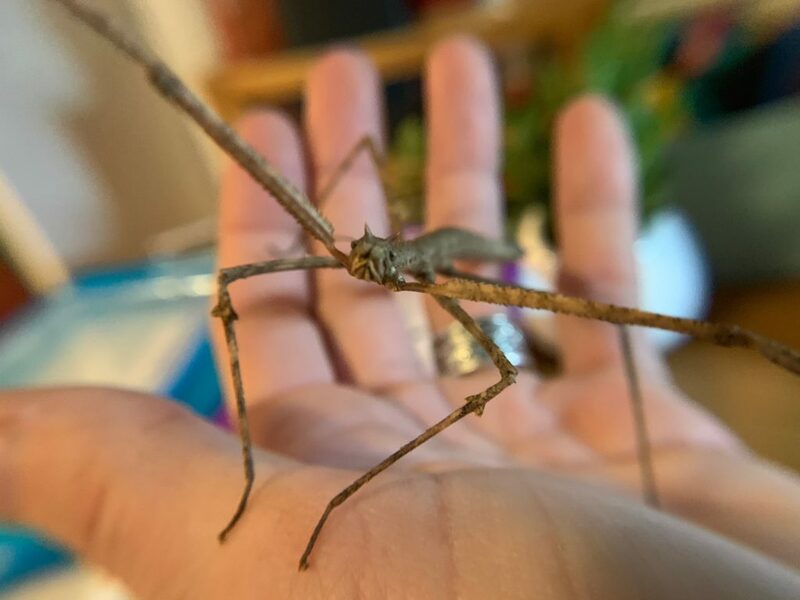 Larry is part of a trio of Vietnamese Stick Insects that were given to me by a friend. (Only bug people give each other insects the way other people trade Poke Mon). But, there are many, many varieties of stick insects out there for sale for a not very high price, and they are extremely easy to care for. These particular stick bugs (Larry, Curly, and Moe) live in a large mesh box with a number of sticks and branches of fake leaves for them to blend into. Every day, I spritz their entire enclosure, and every other day I take out their old Romaine lettuce leaves and give them fresh ones. That’s it. They are super fun to watch, easily handled (with care), and very low-maintenance. My friends here, Larry and Tick/Tock and Pider, are literally just the tip of the easy-to-care for insects you can own. You can get butterflies and lady bugs and so many kinds of beetles and mantids and spiders and all of them are entirely enjoyable to be with, and do not require walking on even the coldest days. Owning insects as companions and pets is also a FANTASTIC way to introduce kids to science! Taking care of bugs is completely different than taking care of mammals (our usual pets) and requires a bit of research to truly understand their unique care requirements. Learning what you need to do for a mantid verses a beetle opens you up to a whole world of science you may never otherwise get to experience. There are many long-lived insects out there, but many are not. Which means you also get to have more companions over all, and learn more each time you do. If you want the chance to meet some very cool, friendly insects for yourself, you know what to do! 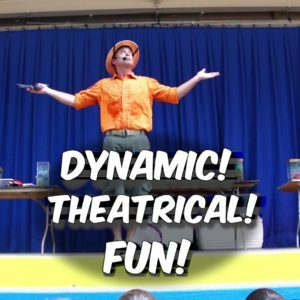 Come to Tony’s show this Saturday, February 2nd, at Discovery World and see for yourself how fascinating and satisfying interacting with insects can be! and, as always, spread the word! Help Tony and all of his team bring these experiences to everyone through the Gateway Science Center! 2019 promises to be a year of big – BIG change. This is the year we will begin fundraising for our permanent location… somewhere in the area of Waukesha. If you’re not familiar with our vision please click here to watch our videos. SUBSCRIBE to our YouTube channel. In July we will release a new series of videos in the Tales from the Bug Whisperer series. Right now you can watch our award-winning pilot episode, Who Wants to be an Entomologist? For free. Tell your schools about our live show. While we don’t have our science park yet, we do have a spectacular outreach program! For 2019 we will have new animals every month! SHARE the below promo video. Volunteer: If you want to help let us know. We can always use new talent. Bloggers, fundraisers, grant writers, photographers, videographers, graphic designers, and just enthusiastic science lovers welcome. As a nonprofit, we depend on you. You can donate by clicking the “DONATE” button or purchase something from our Shopify store. 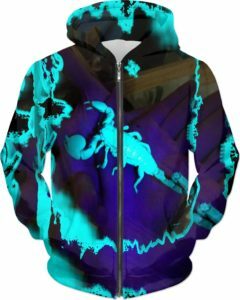 We have some of the most spectacular t-shirts, hoodies and more. As always, thanks for visiting the website, and for letting me hang out with you. See you soon! SPRINGTIME IS HERE!!.. JUST KIDDING. INSECTS YOU CAN WEAR! SHOP NOW.